Your family is always welcome at Tifereth Israel Synagogue. Our congregational family is enriched by diversity. If you are an interfaith family or someone whose life has been touched by an interfaith relationship and would like to learn more about our efforts at Tifereth Israel Synagogue, please contact Rabbi Josh Dorsch at rabbidorsch@tiferethisrael.com or Beth Klareich at program@tiferethisrael.com. As a synagogue affiliated with the Conservative movement we invite interfaith families to make us your spiritual home. Our rabbi, staff and leadership will welcome you with open arms. At Tifereth Israel we believe in the following passage from the bible. “The stranger who dwells with you should be like one of your citizens; love him like yourself, for you were strangers in the land of Egypt”. We offer couples and interfaith families the support and resources to create Jewish homes and to practice and grow in Judaism. We have many engaged and committed interfaith families. We welcome the participation of interfaith families in the life of the synagogue. As a community, we are enriched by the participation of many interfaith families. 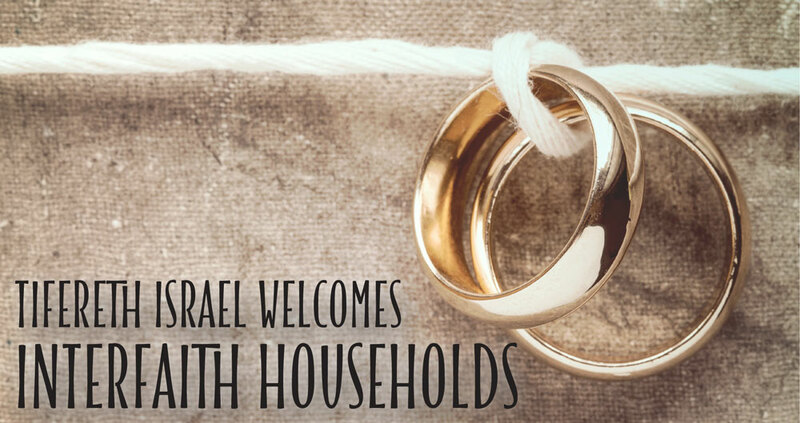 Tifereth Israel supports and engages interfaith families and welcomes the non-Jewish partner to participate in Jewish life to the extent of their personal comfort. We want all of your family members to be part of our congregational family and we encourage your participation in all of our programs. Whether you’re celebrating a birth with a brit milah (ritual circumcision) or a naming ceremony, a bar or bat mitzvah, wedding or any other joyous occasion, we want to share your milestone. Family members who are not Jewish can participate in these ceremonies in various ways, and Rabbi Rosenthal is happy to discuss those options. And, of course, in times of need or loss, Rabbi Dorsch and our congregational family want to be of support and comfort to your entire family. One need not be Jewish to take advantage of the many educational opportunities offered by the synagogue. Everyone is welcome to participate in our adult education programs and classes. A child need not be Jewish to attend the Ginsburg Infant Center or Silverman Preschool at Tifereth Israel. Children of interfaith couples may be enrolled in our Abraham Ratner Torah School, provided that the child is Jewish or that there is intent to have the child converted to Judaism. Shabbat, holiday and weekday services are open to members of all faiths and we welcome you to join us anytime. If you are less familiar with the service, we would be happy to have an ambassador sit with you during services. There are transliterations and English translations of all prayers in the prayer book. And our Rabbi or members will be happy to explain the service to you. We welcome the opportunity to meet you for a cup of coffee and to learn more about your family. Please be in touch at any time. Additionally, we invite you to reach out to Beth Klareich, TIS Program Director, with any other questions or suggestions. The following organizations offer wonderful resources and we encourage you to visit their websites.